The moment I sunk into the warm mismatched chairs at The Haunch of Venison, I knew that Salisbury was a special place. Sitting down for a hearty meal of soup, bread, and beer in a city so old makes modern problems seem trivial. My thoughts were not on myself, but rather on who was there before me. Did a 14th-century traveller once warm himself by the same fire? Who knows, but my imagination was ignited. Welcome to a tour of the quintessentially English city of Salisbury. Salisbury is located in Wiltshire county, southwest England. It’s about nine miles from Stonehenge. Salisbury is surprisingly empty of visitors. Then again, I visited in the middle of January. Temperatures are freezing and the skies are dreary. Despite the bad weather, I’m determined and wondering how to best spend my limited time here. The reason everyone visits (or bypasses) Salisbury is its proximity to Stonehenge. Is there any place on earth more famous? More mysterious or intriguing? 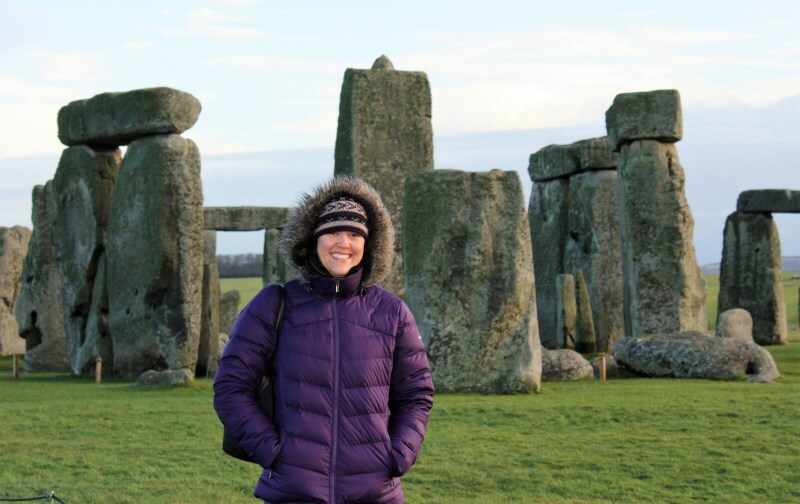 Stonehenge was on my bucket list for a long time. Although a January visit isn’t ideal, it has its advantages. If you haven’t been to Stonehenge in a while, the first thing you’ll notice is that everything is different. Visitors are no longer allowed to walk freely roam the ruins. You must buy a timed ticket and take the shuttle bus up to the ruins. The advantage of going on freezing cold day in January is that it’s empty. My friend and I were the only two visitors at the ruins for about an hour. Even with our faces red and raw from the stinging sleet, visiting Stonehenge is an unforgettable experience. I only have one regret. We missed the one day of the week when visitors are allowed to see the ruins up close. Salisbury is amazing. It is exactly what you would wish for in an English city. 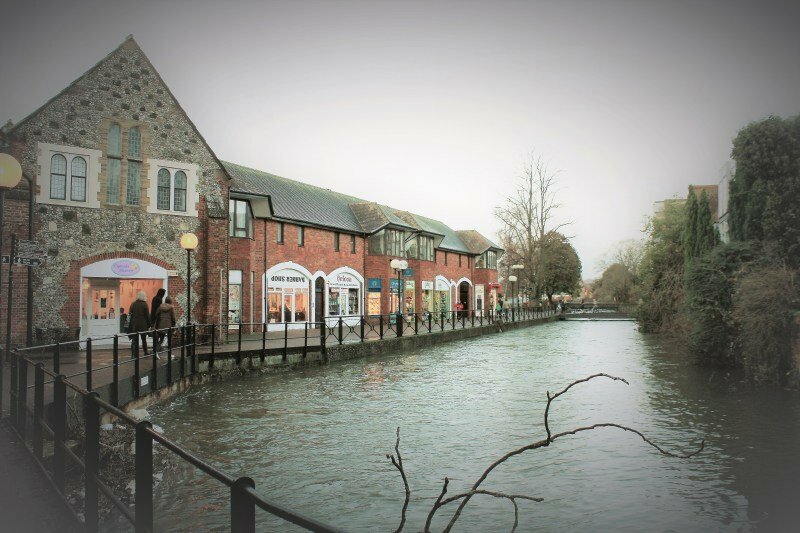 Although it’s officially classified as a city, Salisbury feels like a cosy village. It has it all. Intriguing history, an imposing cathedral, and one very unique pub. There’s no better place to unwind after a day at Stonehenge. You never know what you’re going to find around town. The downtown scene is loaded with great shops, pubs, museums, galleries and restaurants. This is a place I could call home. English history lies somewhere between myth and fact. Legends mingle with historic chronicles to form a feast for the imagination. There’s no way to know exactly how long ago humans first settled in Salisbury. There is some evidence that the hill fort at Old Sarum has been occupied since at least 8,000 BCE. Salisbury has been a part of the myths and legends of the Iron Age, Roman occupation, the history of King Arthur and his knights, and the brutal invasions of the Saxons. There’s even a historical novel about this area called Sarum: The Novel of England . Old Sarum is even mentioned in the famous Anglo-Saxon Chronicle. The chronicle notes, “In this year (552) Cynric fought against the Britons at a place called Searobyrg.” Searobyrg is the Anglo-Saxon name for Old Sarum. Salisbury stands out as unique among my travels. Even though we will never know just how long Salisbury has been occupied. The old saying, “the absence of evidence is not evidence of absence,” comes to mind. The settlement at Old Sarum is likely connected to the stone monoliths of Stonehenge and Avebury. The hill stands at the intersection of two ancient trading paths. The Romans were definitely not the first to occupy Old Sarum. When the Romans took over, the fort was already occupied by a tribe of exiled Gauls called Atrebates. Old Sarum was next captured by the Saxons. In 1070 William the Conqueror decided that Old Sarum was strategically valuable. He built a motte-and-bailey castle right in the middle of the hillfort. Can you imagine what they must have found in 1070? Digging the foundations on top of eight-thousand years of history probably turned up some amazing artefacts. Historians think that the original castle was built of timber. The fortified stone structure doesn’t appear until sometime in the thirteenth century. Sadly, little remains of this castle today other than exposed foundations For 150 years Old Sarum was an important centre of both secular and religious government. Despite all of that intriguing history, Old Sarum is the most famous for being Eleanor of Aquitaine’s jail. She remained confined at Old Sarum for sixteen years. She incited her sons to rebel against their father, King Henry II. The history of Old Sarum and Salisbury merge in 1219. Water shortages, strong winds, fighting between the clergy and military, as well as a housing shortage all hastened Old Sarum’s decline. In 1219 construction of a wooden chapel began at the site of the Salisbury cathedral we know today. Salisbury is probably the most famous for its Cathedral, also known as Cathedral Church of the Blessed Virgin Mary. This is the site of Britain’s tallest spire, as well as the world’s oldest working clock. Finally, the cathedral has one or the original copies of the Magna Carta. When teaching world history to my 9th grade students it really helps to whip out a photo and show them what the real Magna Carta of 1215 looks like. An entire day could be easily spent exploring the cathedral. The main cathedral took 38 years to complete and was finished in 1258. It’s a superb example of Old English Architecture. Salisbury Cathedral is a fascinating place to find the remnants of the cathedral at Old Sarum. You can’t walk ten feet without finding a piece of Romanesque stone from Old Sarum. One of the more famous tombs you’ll find at Salisbury cathedral is that of Lady Catherine Grey. She is the sister of Lady Jane Grey and great-niece of Henry VIII. Her story of intrigue and competition with Queen Elizabeth is worthy of a movie. You’ll also find the effigy tombs of many famous bishops and lords in English history, but Lady Catherine Grey’s story is by far the most interesting. Salisbury Cathedral was built because the clergy and the military at Old Sarum couldn’t get along. Legend has it that the Bishop of Old Sarum shot an arrow into the sky and decided to build the cathedral where the arrow landed. My photos really don’t do the cathedral justice. It was cold, wet and I was hungry. My photos are almost an afterthought, and I wish I had taken more. However, you can find more info about the cathedral as well as several beautiful photographs on Salisbury Cathedral’s Wikipedia page. As a historian, I am by no means a fan of Wikipedia for academic research. However, it is absolutely awesome for a general overview of a travel destination. You’ll not find a more English village. We ended up staying just outside of the city and spent the evening gazing at hundreds of years of English architecture. Particularly interesting are Salisbury’s market squares. Amazingly, Salisbury has held a Tuesday and Saturday market in the same place since 1227. A span of longevity that’s tough to match. In 2027, Salisbury will hold its 800th fun fair. Be sure and look for the unique market monuments spread throughout the downtown village. Some date to the fourteenth century. Several smaller medieval churches also await exploration in Salisbury. For more information check out Salisbury History and Heritage. Do not miss this place. The Haunch of Venison is Salisbury’s oldest pub, and full of mysteries. Inside you will find good beer, good food, and engaging conversation. On top of that, you’ll hear a legend about a severed hand and secret tunnel under the bar. I spent hours in the pub drinking beer, sampling hot soup and bread and chatting with local residents about the history of Salisbury. I arrived about 4pm and the place was empty. It was a great time to talk to the bartender about local lore. Even though I only had a few days in England, my day in Salisbury was definitely worth it. To be honest, there’s still plenty left to see. The museum in town is pretty extensive, but I found myself rushing through it out of fatigue and hunger. If you’re ever anywhere near Stonehenge, Salisbury is truly worth a detour. You never know which of histories mysteries you’ll uncover next.